« 2018 – 19 Auditions! 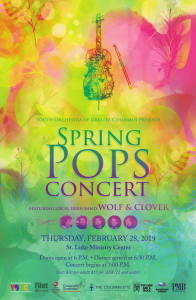 The Youth Orchestra of Greater Columbus presents its Spring Pops Concert, featuring local Irish folk band Wolf & Clover, on February 28, 2019 at St. Luke Ministry Center. Doors open at 6:00p, dinner service begins at 6:30p, and concert begins at 7:00p. This year’s Maestro for a Moment candidates will also be revealed!